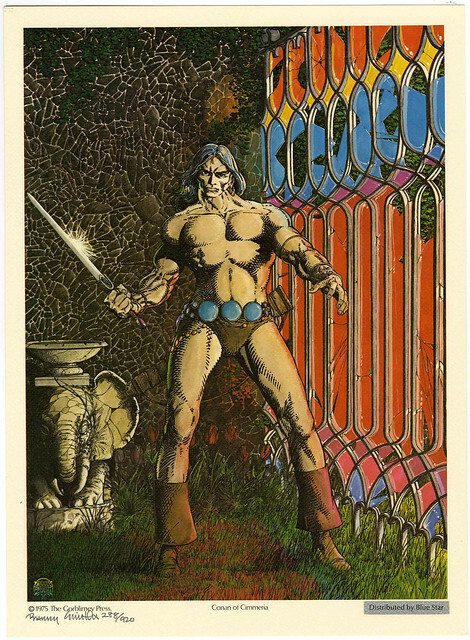 Giant-Size Geek: Barry Smith 1975 Robert E Howard Portfolio: Conan, Solomon Kane, and more! Barry Smith 1975 Robert E Howard Portfolio: Conan, Solomon Kane, and more! Last week I showed off a few plates from Barry Smith's pen and ink Tupenny Conan portfolio from 1974. 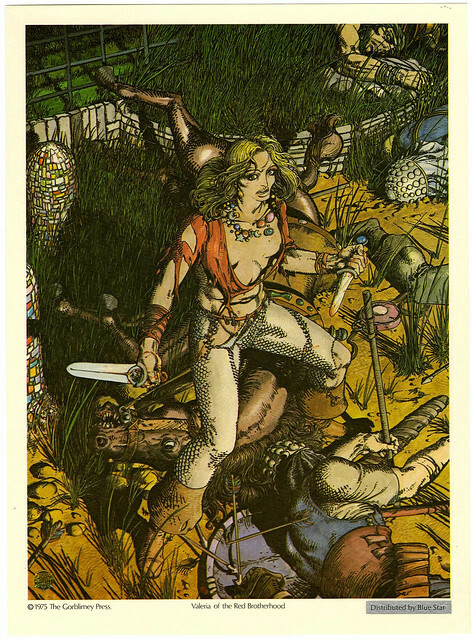 A year later in 1975, Smith published this full color portfolio of assorted Robert E Howard heroes. Conan of Cimmeria. 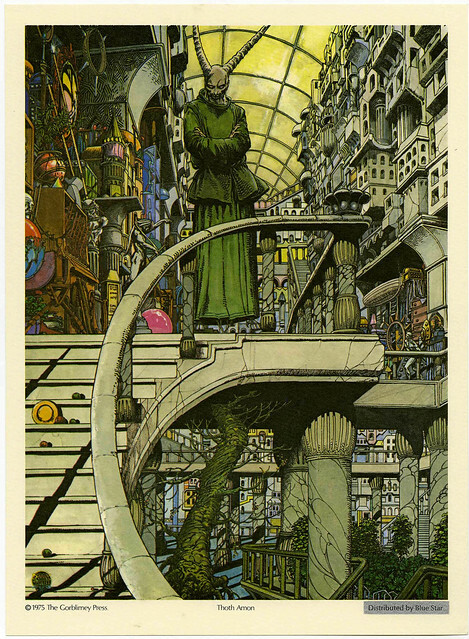 Barry Smith draws very detailed backgrounds and the stained glass on the side makes Conan pop out of this scene. Notice the fountain on the lower left, which reminds me of the Tower of the Elephant from Conan the Barbarian #4. 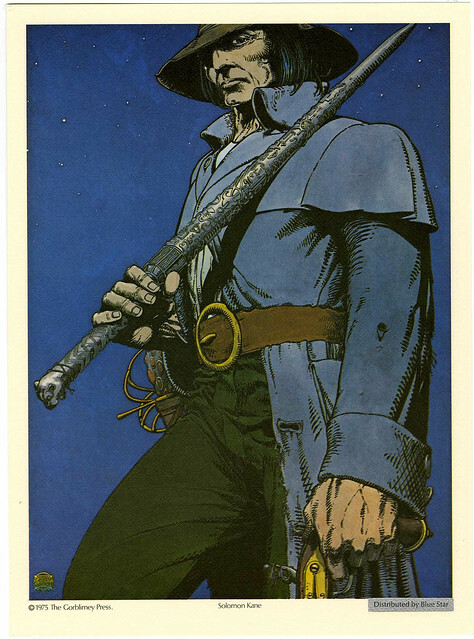 Solomon Kane. We've seen Kane stories illustrated by a number of artists, but this plate makes me wish Barry Smith had drawn a Kane short story for Marvel. Smith adds a lot of details to make us believe this Puritan is equipped to fight evil. Thoth Amon, Conan's wizardly adversary. He resides in a resplendent city state, unlike Conan, who camps out in the wild. Valeria of the Red Brotherhood. If you read Marvel's adaption of Red Nails in Savage Tales, you would recognize this lady immediately. I always liked her, perhaps even more than Red Sonja, because she was an interesting character and a formidable fighter. For more Barry Smith splendor, check out Cap'n's Comics post last week, and my own ever lovin' site Giant-Size Marvel! Nuff Said.